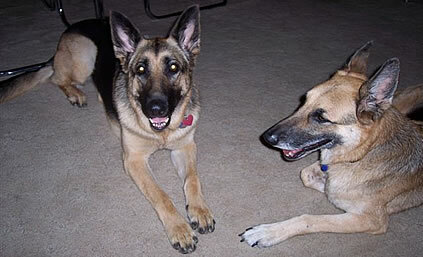 Our Mom adopted us (Harley) on February 4, 2006, and (Gypsy) on June 25, 2006. We’re so happy to have a nice home where we are loved and cared for. Our Mom says we live better than most people’s kids and we think that’s probably true. We get to go out and run and play when our Mom goes out to feed and care for the horses. We have 2 ½ acres to run on so we get lots of exercise. We’re not supposed to chase or tease the horses, so the first thing we had to do was learn the rules, but we’re very smart and it only took a couple of days. There are other dogs in their yards on both sides of us and it’s such fun to visit with them. We have our little “routine” that we do every day. When we finish up our horse chores we get brushed, and then we either lay on the back patio or go in the house with Mom depending on the weather. If she goes anywhere she takes us with her as long as it’s not too hot for us to stay in the truck while she goes into a store. We love to go for rides and we’re very unhappy when we don’t get to go. We don’t understand when it’s too hot for us to be able to sit in the truck. We just get better and better every day and we’re currently working on fine tuning our obedience skills. Come by and see us sometime. We just love it when people come to visit us! Thank you GSROC for finding us our forever home.